The 1996 Australian Grand Prix was a Formula One motor race held on 10 March 1996 at Melbourne. It was the first time this race was held in Melbourne, taking over from Adelaide as the host of the Australian Grand Prix. 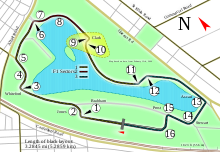 It was the first time the Australian World Championship round had been held at the site of a previous Australian Grand Prix venue, albeit on a vastly different circuit, with the surrounds of the Albert Park Lake having played host to the Australian Grand Prix in 1953 and 1956. This was the debut race of the future world champion Jacques Villeneuve. This was second grand prix in a row held in Australia, the previous race being the conclusion to the 1995 season. Taki Inoue was scheduled to race for the Minardi team as a pay driver but when no money materialised prior to the race he was replaced by Fisichella. Marlboro had expressed interest in Fisichella running early on. The race was the first to use the new race-start system, still used in Formula 1 today, replacing the old red to green light system. Under the new system, five red lights would come on at one second intervals, starting after the last driver reached his grid box. There would then be a pre-determined pause, and then the five lights would go off simultaneously.This was also the first race to have a single qualifying session on Saturday afternoon; the Friday session had been dropped for 1996. Jacques Villeneuve, making his début in Formula One, took pole position. The measure was introduced as excessively slow entrants presented potential safety hazards due to a high speed difference. It was an all-Williams front row with Damon Hill and debutant Jacques Villeneuve in the blue and white Rothmans cars. In the first corner Hill was squeezed by Irvine, lost momentum and was overtaken by both Ferraris in the run down going into the third corner. Behind Hill, Alesi sliced across in front of Hakkinen and Barrichello to claim the corner and began a chain reaction of heavy braking as drivers tried to avoid colliding with one another. David Coulthard veered left under braking and his McLaren hit the side of Herbert's Sauber. Herbert tried to avoid the car and braked heavily. Martin Brundle was behind them and unable to slow sufficiently, hitting the rear of Herbert's and Coulthard's cars and was launched into a barrel roll, ending in a sand trap at turn 3 and breaking his car in two. Brundle was unhurt. The race was halted to allow the circuit to be cleared. The race was restarted. Brundle spun off after light contact with Pedro Diniz. The Williams dominated again, with Jacques Villeneuve leading Hill. Schumacher held on in third place, but dropped back half a minute with his second pit stop. From lap 28 Schumacher had problems with his brakes. Irvine assumed third, despite contact Jean Alesi's Benetton on lap 6, when Alesi had attempted to pass him. Towards the end of the race Villeneuve was slowed by an oil leak, which allowed Hill to catch and pass him. Hill took his 14th Grand Prix victory, equaling his father Graham's overall number of wins. Hill took back to back Australian victories, the previous race being the last round of 1995, in Adelaide. In the end, the podium was Hill-Villeneuve-Irvine. ^ "Minardi to get Fisichella?". www.grandprix.com. 4 March 1996. Retrieved 8 August 2017. ^ "Five drivers bidding for Minardi". www.grandprix.com. 15 January 1996. Retrieved 8 August 2017. ^ a b "Grand Prix Results: Australian GP, 1996". Archived from the original on 30 May 2009. Retrieved 28 May 2009. ^ "FIA Formula One World Championship - Lights and Pit Lane" (PDF). FIA.com. 14 March 1996. Archived from the original (PDF) on 2 March 2005. Retrieved 20 January 2010. ^ "Martin Brundle's Melbourne crash". www.grandprix.com. 11 March 1996. Retrieved 8 August 2017. ^ "1996 Australian Grand Prix". formula1.com. Archived from the original on 1 November 2014. Retrieved 24 December 2015. ^ a b "Australia 1996 - Championship • STATS F1". www.statsf1.com. Retrieved 6 March 2019.